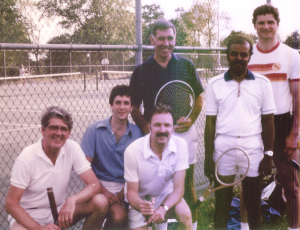 In 1984, the very talented Johnson Controls Tennis Team won the championship of the Industrial Tennis League in Milwaukee. Do they still have those leagues today? They were great fun. The members of the team were from left to right: Ron Caffrey, Steve Thompson, Lou Davit, Jack Vierheilig, V. Vairvvan, and Mike Kafka. How many did you know and recognize? Editor’s Note: Do you have any pictures that you would like to share? Everyone enjoys recalling these stories and the people who shared their Johnson Controls career experiences. Please send the in with a note on the story behind the photo, email or snail mail will work just fine. Then, look for your story here and in the Newsletter.